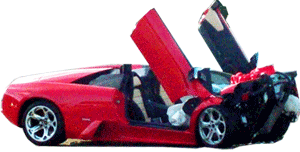 A father picked up his 20 year old son in this borrowed Lamborghini. Shortly after picking up his son, the car lost control during a shift, hit a curb, flipped over and burst into flames. Both the father and son were killed. 2004 Lamborghini Murcielago. Happened in Odessa, Texas, USA.